Cities listed below are those as defined by the states in which they are located. Also included are former cities that have lost city status due to LGA amalgamations or other factors. (c) satisfy the criteria specified in paragraphs (a) or (b) apart from the population criteria, and be a homogenous centre of importance as a focus of regional commercial, governmental or cultural activity beyond that which would normally be regarded as local, suburban, or subsidiary to another nearby centre. 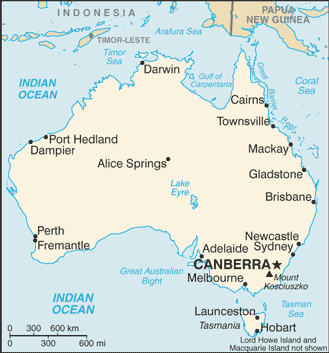 New South Wales, therefore, has two types of "city": cities that are acknowledged on the register of the Geographical Names Board of New South Wales, and local government areas that have been proclaimed as cities but are not acknowledged on the Geographical Names Register. This list includes local government areas inside the Sydney metropolitan area but excludes cities also acknowledged on the Geographical Names Register. ^ Local Government Act 1993 Archived 15 June 2016 at the Wayback Machine, Chapter 9 – "How are Councils Established?". Accessed via AUSTLII on 26 April 2007. ^ Robert Harrison MLA, Private Members' Statement: Proposed Shellharbour City Archived 29 September 2007 at the Wayback Machine, New South Wales Legislative Assembly, Hansard, 23 November 1995, p. 3960. Accessed 26 April 2007. ^ Garry West MLA, Questions on Notice: Hastings Council Name Change Archived 29 September 2007 at the Wayback Machine, New South Wales Legislative Assembly, Hansard, 19 November 1993, pp. 6008–9. Accessed 26 April 2007. ^ "Geographical Names Register Extract: List of placenames acknowledged as a CITY" (.CSV). Geographical Names Register (GNR) of NSW. Geographical Names Board of New South Wales. Retrieved 31 August 2008. ^ "History of Griffith". Griffith City Council. Archived from the original on 26 July 2008. Retrieved 19 August 2008.